Edna H. Guenther, 100 years, of North Holden Street, Port Washington, died peacefully Friday, September 21, 2012 at Ellen’s Home in Port Washington where she has resided for the past two years. 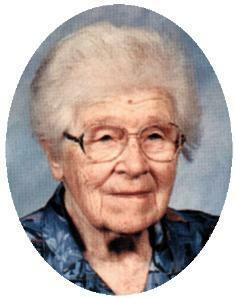 She was born on February 25, 1912, daughter of Samuel J. and Wilhelmina Scharl Guenther. Edna’s grandfather Gottlieb started the Guenther Family Brickyard on what is now Veterans Park (Band Shell) in Port Washington. Until the 1930’s, Guenther Brick is Port Washington. The family farmed the Upper Lake Park, their brickyard on the Lower Lake Park with its spring-fed waterhole. Most of Port Washington’s buildings, sidewalks and streets were made of Guenther Brick. Edna grew up in and around the daily workings of the Brickyard. She graduated from Port Washington High School in 1930. She began her career as a secretary for PW School District Superintendant Dunwiddie until 1937. She then moved over to Modern Equipment Mfg Company of Port Washington. They now had a staff of two. Edna was responsible for accounting, clerical, and estimates amongst others. She retired in 1977. At that time, there were twenty in the office staff. Edna remained on North Holden Street for many years. She could be seen walking her buddy Fritz and observing the latest high school traffic. Edna and her sisters Anna and Hilda lived together in the family homestead for most of their lives and they each reached a fruitful age. They cared for their parents and each other, with Edna remaining. She was proud of her family, Port Washington and their heritage. She had been very active throughout the city. She was an active member and board member of the Judge Eghart House. She was an active member of the Port Washington Historical Society, volunteering to give tours at the Light Station. She was on the Port Washington Cemetery Association Board (Union Cemetery). For 24 years served on the Port Washington Commission On Aging, leaving in 2001. Edna held the most offices in the Order of the Eastern Star since the age of 18 in 1930 and achieved the highest degree, Worthy Matron, two times. She was active in her church, Friedens Ev. Lutheran. She served on numerous church councils and building committees and was a charter member of the Evening Ladies “Guild” Fellowship, along with being a Sunday School Teacher, Choir Member and a member of the Afternoon Guild. Through Friedens, she volunteered at Cedar Lake Campus in West Bend, using her seamstress and clerking abilities, helping with laundry and assisting the Alzheimer’s residents. She even was a member of their Auxillary Board. She will be remembered for her caring, support and fiestiness. Edna is survived by her nieces Susan (Tim) Rafferty of Brighton, MI, Jean (Ron Winter) Gilliland of Ossineke, MI, Ann Horton of Naples, FL; her nephew Walter (Joanne) Guenther of Gualala, CA, further survived by 7 grandnieces and nephews and 9 great-grandnieces and nephews, other relatives and many friends. She is preceded in death by her sisters Adeliade Gilliland, Anna and Hilda Guenther and brothers Felix and Walter. She is also preceded by her canine pal Fritz. Pastor Brandon Lemons will officiate funeral services 1 pm Wednesday, September 26, 2012 at Friedens Evangelical Church, 454 N Milwaukee Street, Port Washington. Visitation 11 am to 1 pm Wednesday AT CHURCH. Interment Union Cemetery, Port Washington. Memorials to the Judge Eghart House(PO Box 87, Port Washington, WI 53074), Port Washington Historical Society (PO Box 491, Port Washington, WI 53074) or Friedens Church appreciated.